If you would like to join me for my Feathers on Friday meme, please put the link to your blog post in the comments and I’ll add the link to my post. A gang of Black-capped Chickadees have started visiting my feeders and sometimes they sit long enough for me to digiscope a few photos. 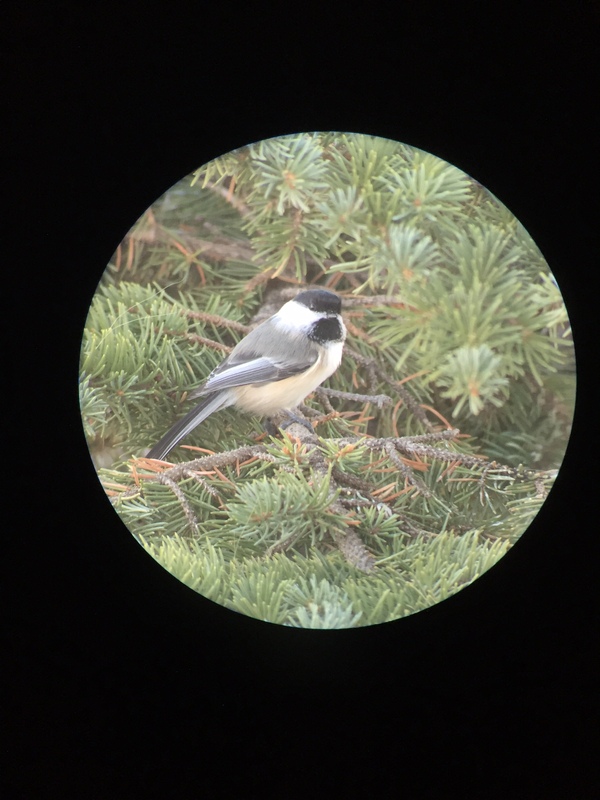 This entry was posted in Alberta Birds, Autumn, Birding, Birding Trips, Blogging, Canada Birds, Digiscoping, Feathers on Friday, General Birding, Nature, Photography and tagged Black-capped Chickadee, Digiscoping, Feathers on Friday, Phone Skope, Swarovski Scope. Bookmark the permalink. ://janesheartsong.files.wordpress.com/2015/09/pictures-030-2.jpg Hi Charlotte I write a blog too and came across yours via the Facebook group.Good work! Great idea on the Feathers on Friday. Here is my blog: http://www.bybirdblog.blogspot.com. Keep up the good work! Nice image for a modified iPhone. Reminds me of a Christmas card.